Mederma® Quick Dry Oil 60 mL -- one for you and one for a friend! Yes, I would like to receive emails from Mederma®. Copyright © 2019 Merz North America, Inc. All rights reserved. This site is intended for U.S. residents only. Mederma® is a registered trademark of Merz Pharmaceuticals, LLC. 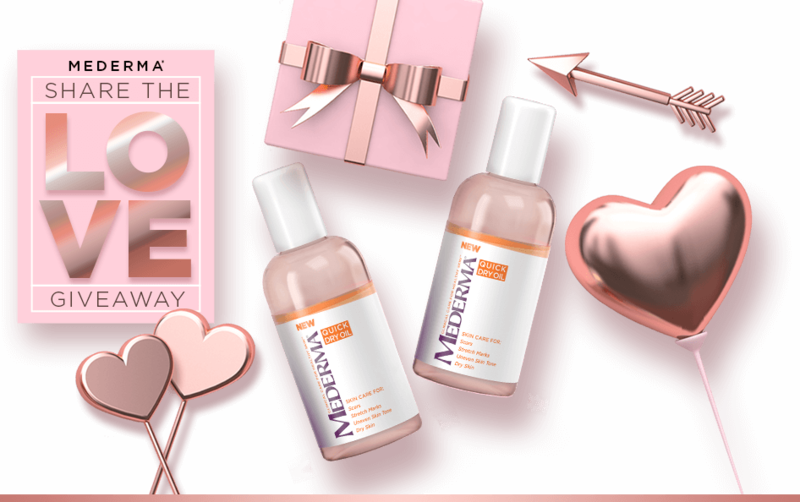 Tell your friends about the Mederma® Share the Love Giveaway! Thank you for participating in the Mederma® Share the Love Giveaway! This promotion starts on February 1st, 2019 at 12:00 AM ET. Please come back and enter! NO PURCHASE OR PAYMENT NECESSARY TO ENTER OR WIN. Open to legal residents of the 50 U.S. / D.C., age 18+. Void outside the 50 U.S./D.C. and where prohibited. Sweepstakes starts at 12:00:00 AM ET on 2/1/19; ends at 11:59:59 PM ET on 2/28/19. There is a limit of one (1) entry per person per 24 hour period. Odds of winning will depend upon the total number of eligible entries received per daily entry period. For full Official Rules, click here. Sponsor: Merz North America, 6501 Six Forks Road, Raleigh, NC 27615.